Jude does everything to keep her kids safe and on track for college. It has always been easy– until senior year of high school. Suddenly she is at a loss. Nothing feels safe anymore; every time her kids leave the house, she worries about them. 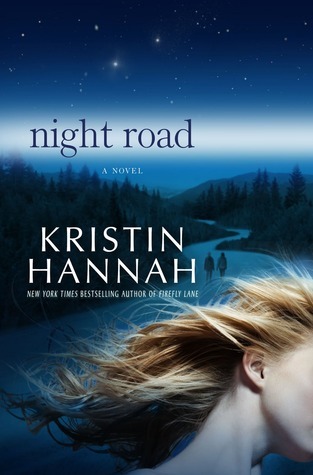 This is a hard review for me to write because I love Kristin Hannah’s books and while I did give it 4 stars, I had some serious issues with a few of the characters in it. Anyone who has read Ms Hannah’s books before, knows that she takes a family type issue and expounds on it in a way to everyone can try to relate to, however, unlike other authors who write similar stuff, she does provide a concrete ending to the situation and doesn’t leave the reader hanging. In the case of Night Road, she takes teenage drinking, teen pregnancy and consequences of those respective actions and ties it up on a well-written book. Personally, my issues with it stem from the character of Jude, the mother. Through-out the book, in the lead-up the the tragedy (which at least I saw coming), she is portrayed as being this mother who some would call (and even I would), a helicopter mother. Always hanging around her kids, making sure that they have everything that they need – which in itself is good, however, there is a point when it almost becomes too much and for me she reached that point when she was still acting this way when her kids were seniors in high school and about to head out into the world on their own. However, it wasn’t only that that pissed me off about her character, it was her actions in specific part of the book and what appeared to be her inability to take responsibility for the role that she played in the outcome. She had always told her children (Mia and Zach) that they could always call her no matter what and she would come to pick them up from wherever they were no questions asked. The one time that they did get drunk and doing the right thing called her like she asked, they were punished for their behavior. Now, I know that they weren’t innocent in the situation, but at their age, doing what she did, was just asking them to not repeat the action (calling her) in the future and while ultimately playing a major contributing role to the tragedy. I still can’t figure out, however, if her actions following the tragedy were due in part of her denial of her role in it, or her consuming guilt over what happened. I want to say the former, but looking back now (it has been several months since I read this), I’m leaning towards the latter. Someone on goodreads.com posted a discussion question asking if this book would be appropriate for high school students. My resounding answer is yes.